It was a dark and stormy night…again! We are finding that our blissful days in paradise are offset by the occasional night in misery…well that may be a bit too dramatic, but let’s just say that we’ve weathered a few nights in some rather rough seas! We returned to Puerto Escondido yesterday to wait out another honkin’ Norther. This is our first taste of just how strong the North winds are going to start blowing in the northern portion of the Sea, and we’re not too enamored with it! The prevailing pattern seems to be a few days of calm followed by a few days of blow. After spending a few days here in Escondido a week or so ago, we enjoyed circumnavigating Isla Carmen and exploring some new anchorages. More about the places we visited in a minute, but first a little update on fun with mooring balls! 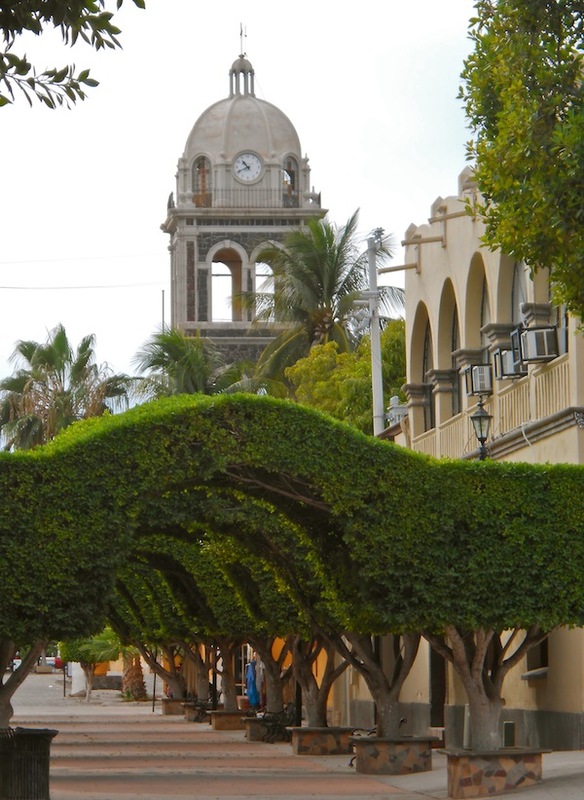 Puerto Escondido is a protected harbor that is advertised as a secure hurricane hole. It has mountains on one side, and is circled by lower hills on all sides, with the exception of two “windows” that are low sandbars on the north side of the harbor that allow the winds in. 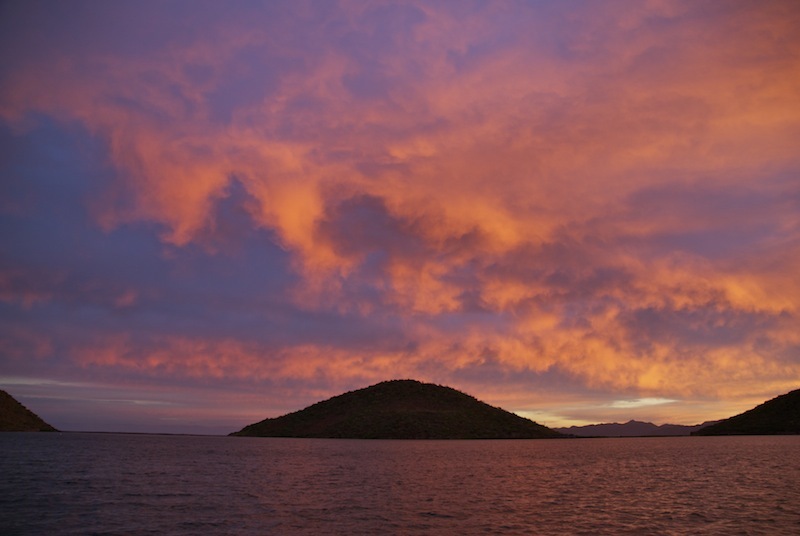 When there is a storm or a low-pressure area in the four corners region of the States, that low causes strong winds to funnel south into the Sea of Cortez. The topography of the sea, with the mountains on either side causes these winds to accelerate and the long fetch of the waves creates very heavy seas. We were anchored just 4 miles away from Escondido when we woke yesterday morning to the sound of the wind building. We quickly got underway, to get out while the getting was good! With north to northwest winds on their way, the anchorage where we were had the potential to become a lee shore and not a good place to spend a few days of high winds. We motored across the channel in building seas and 18-20 knots of breeze, to enter the harbor at Escondido. There are multiple mooring buoys in the harbor, and we had used one while on our last visit, so we headed up into the northwest corner of the harbor to pick up a buoy. These buoys aren’t the user-friendly type like in the States, which have flags on them that you can pick up and tie to. The buoys here are just large floating balls of barnacles with a rusty eyelet on top that is only large enough for a single line (it’s usually best to use two lines; one to each side of your boat to avoid chaffing a single line as the boat swings). Since our deck is 4’ off the water, it’s impossible to grab a buoy from the foredeck, so we have to back down on it and Marty grabs it from the swim step. After pulling the line through the eye, he walks the line to the bow while I drive, trying to keep the boat from swinging too far away from the buoy so that he doesn’t get pulled overboard (or let go of the line..ha). Once the line was tied fast on the foredeck we were secure. Or so we thought! 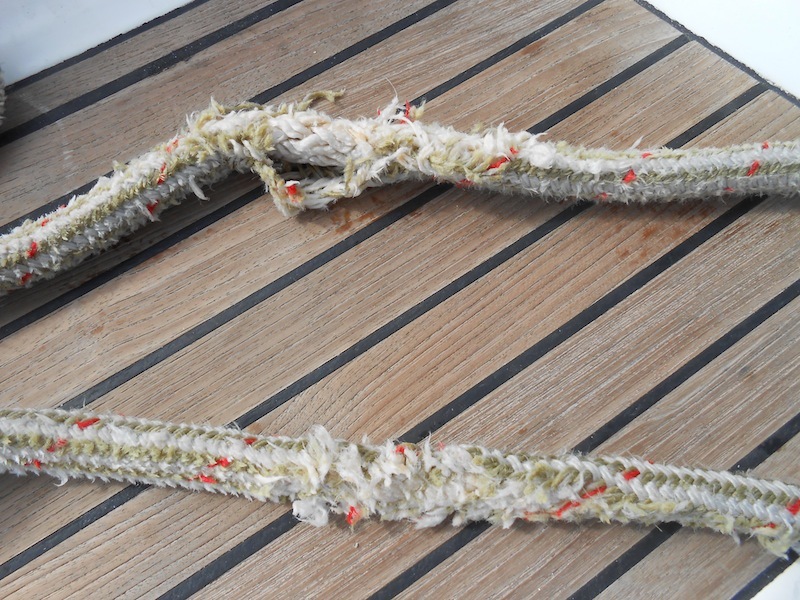 Our mooring line after 5 hours on a rusty mooring ball…not good! After securing ourselves to buoy #74, I shut off the engine and started preparing the boat to stay awhile. In the meantime, Marty gave a shout from the bow that “the buoy just came off”! Huh? The buoy came off? Geesh! We started the engine, untied from the buoy and let it float away, and off we go to try another one. During all this, the winds are gusting in the mid-20’s and we are getting blown off our course constantly as we try to maneuver in close quarters. No problem though, we are soon tied onto buoy #84, the one we had used the week before so we were fairly sure it would hold. However! The winds were gusting so strong that the buoy was pulled under water 4 or 5 feet as our boat was pushed from side to side and our line was sliding back and forth through the eyelet. We kept a close watch on it and after about 5 hours of worrying about the buoy, we decided to let it loose and anchor instead. Once we were set again, Marty showed me the line that we’d had on the buoy and oh my! Our 1” mooring line was now a worthless mess! In another hour or so the line would have parted and we would have been drifting. So, we spent the night swinging securely on our own ground tackle. The night was still rather uncomfortable as we blew from side to side listening to the anchor chain clang, the wind howl, and the boat noises come and go. The plan at the moment is to wait until the winds calm in a day or two before heading back out. Now, back to our regularly scheduled program…the report of our week of fun in the sun! 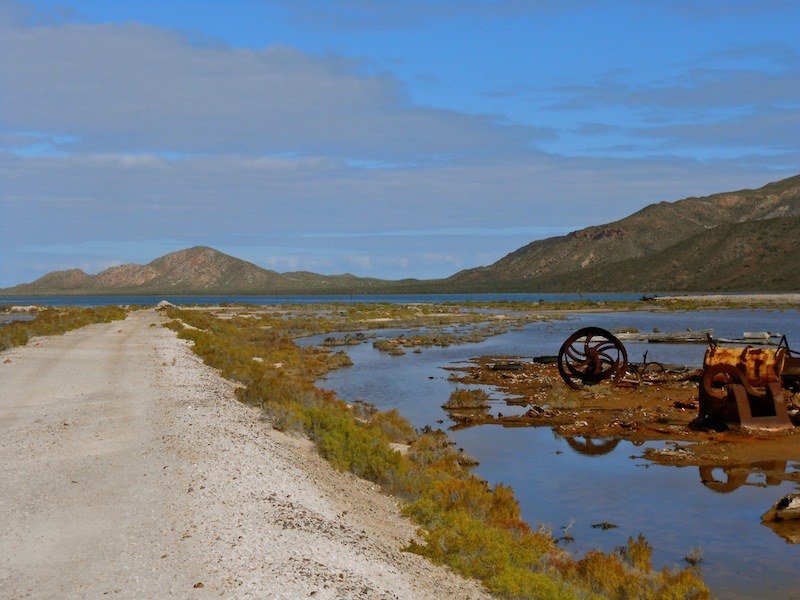 When we were here last week, we rented a car one day and drove into Loreto. It’s a quaint little town with lots of history, shopping and restaurants. It isn’t overly Americanized yet, so the local people are very friendly and we enjoyed a leisurely day of wandering about. Our next stop was across the channel in a tight little cove called Honeymoon Bay. We spent one night there, and met up with some fellow cruisers who shared a bit about their 12 years of visiting the Sea. In another “it’s a small world moment”, they are horse people and spend half their year up in the states traveling around judging equestrian events, and know some of the people that Meg knows through riding. From there we went to a beautiful bay on Isla Carmen, called Bahia Balandra. We were the only boat there and we anchored in about 12’ feet of crystal clear water, with a view of green cactus covered hills. Splash, splash – in the water we went…ahhh! Then out came the kayaks for a paddle around the bahia. At one point I came upon a sleeping blue-footed booby who let me paddle right up to him and snap his photo. 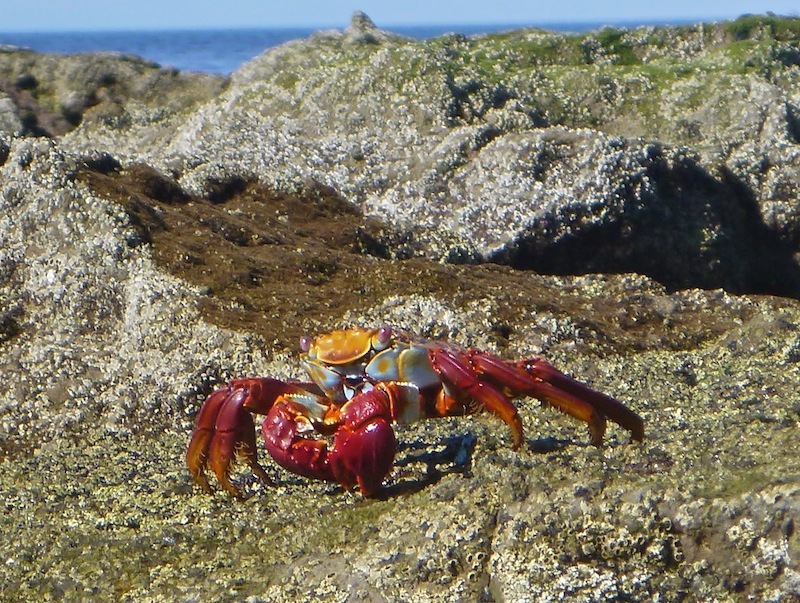 The red crabs on the rocks weren’t quite as cooperative, but there were a gazillion of them scampering every which way! Our second night in this beauteous bahia was a sleepless one as we took turns on anchor watch after the winds clocked around to put us once again on a lee shore (the forecast had called for the exact opposite). The winds at 2am were blowing in the mid 20’s, but it was the sea state that was giving us the most concern. Since we were in such shallow water, the waves were large enough that there was the potential for the keel to touch bottom in the trough of a large wave; not a good option! We kept watch on the depth sounder and at one point we almost weighed anchor, planning to ride the night out away from shore, but thankfully the winds slowed and the sea calmed as well. I spent the rest of the night dozing in the cockpit listening to the waves and watching the stars…it was beautiful if not too restful! In the morning we rubbed the sleep out of our eyes, raised anchor, and headed around the north end of the island to a bay directly across the island from where we were. On our way we saw another example of how the charts in Mexico are sometimes quite a ways off of actual! We were heading around a reef that we had marked on the chart by a GPS location from one of our cruising books. Based on my route on the chart plotter I was heading quite far out to sea when the visual to the closest island appeared in a more direct line. I turned on the radar to see where the island really was, and discovered nearly a mile difference from chart plotter to reality; not a happy feeling! I started a track of our actual passage and it traveled right over the spot where the islands showed on the chart plotter; we must have four keel drive!! Even though I knew that we were in deep water, it was still very disconcerting to be driving over the islets based on the chart plotter display. 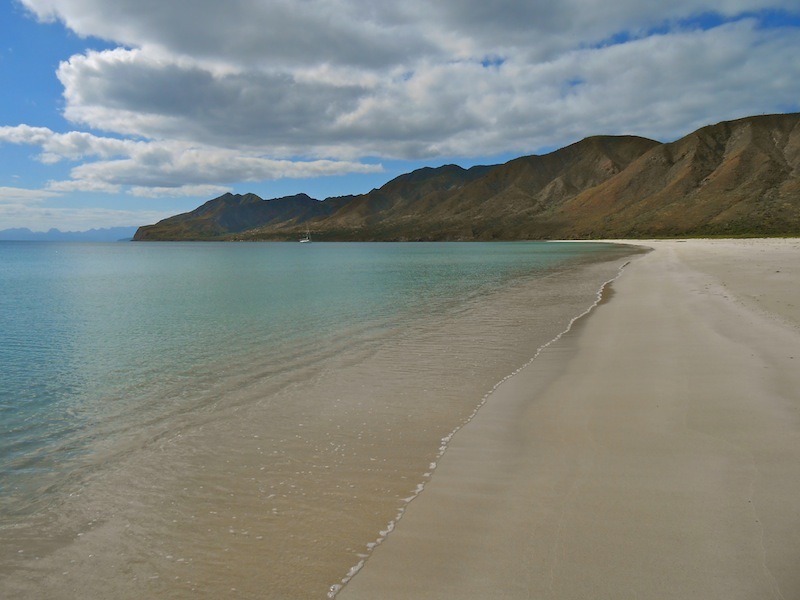 It was a beautiful sail down the outside of Isla Carmen, which is part of the Parque Nacional Bahia de Loreto (a national park). It still surprises me how high and rugged the mountains are in this are, even on the islands. The colors of the cliffs are just gorgeous and they change as the angle of the sun changes. It reminds me of being in the Grand Canyon, if it was full of water! 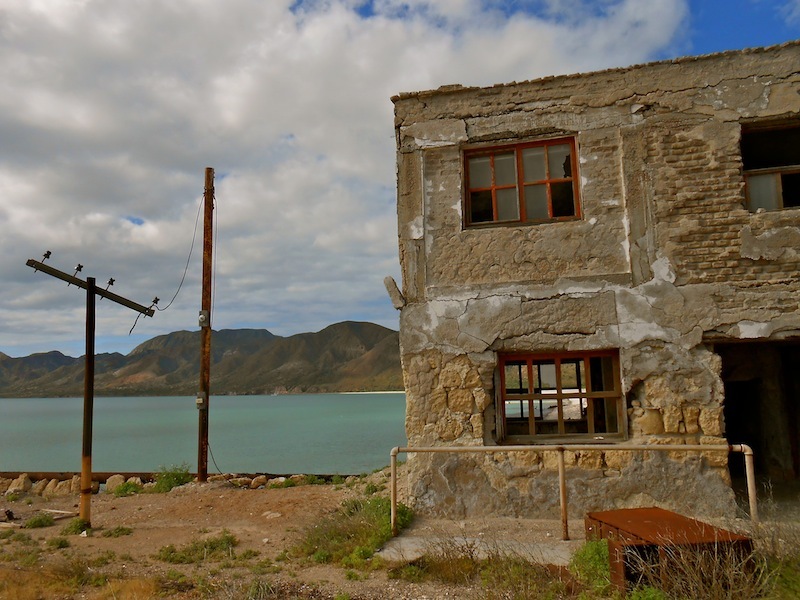 We anchored in a huge bay called Bahia Salinas, which was once the site of a commercial salt operation. 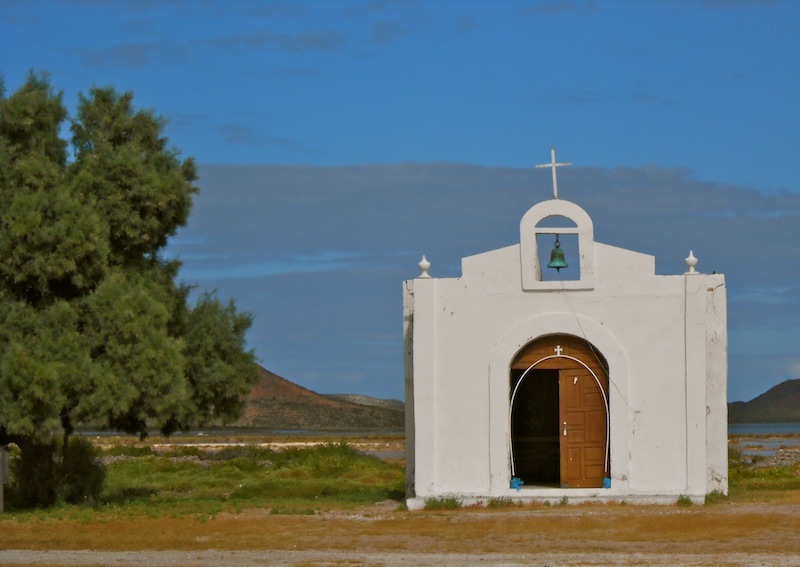 From the time of early explorers, the self-replenishing salt evaporation ponds were a source of revenue for the Loreto area and about 200 people used to live and work in Las Salina. 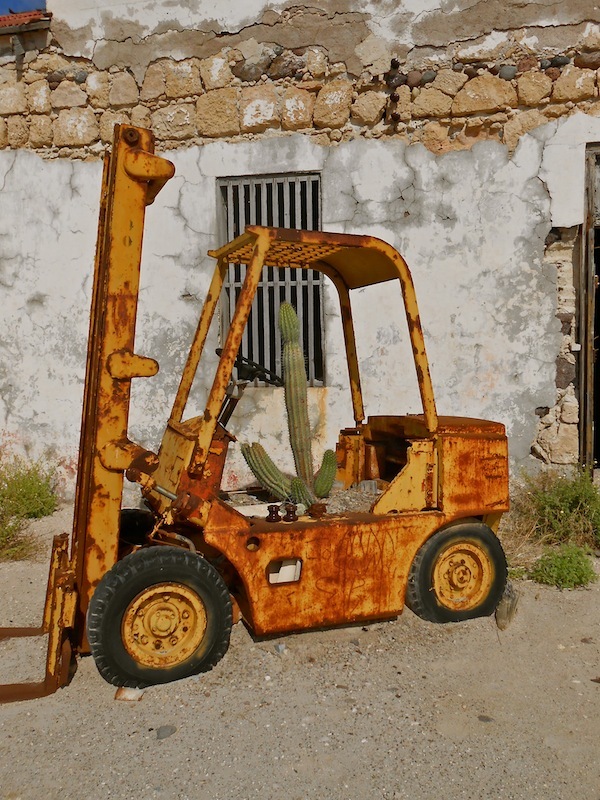 In 1982 the company closed and evicted the workers, and it became a ghost town overnight. 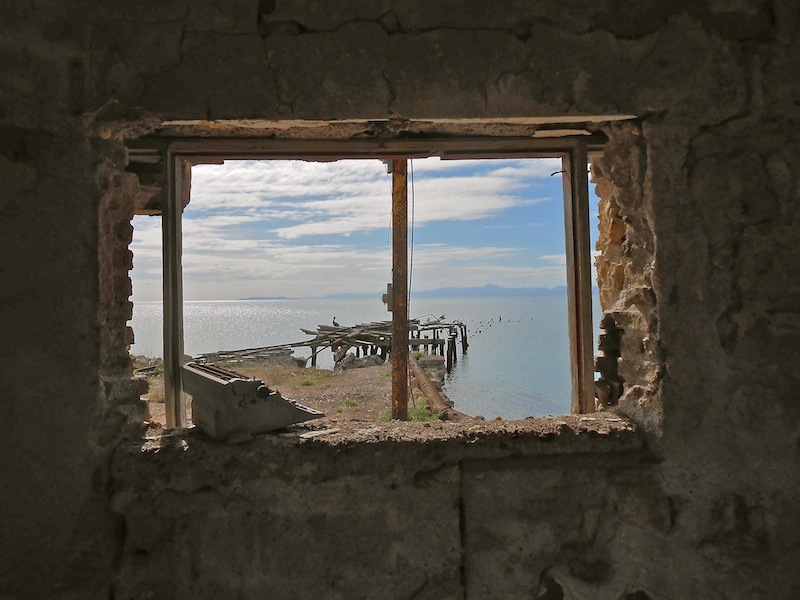 One day we walked through the dilapidated buildings and out to the old evaporation ponds; it was a bit eerie. We soon headed back to the beach and our quiet end of the bahia to enjoy a floating lunch kayak style and a swim. Ahhhh…life is good. After three days in Bahia Salinas it was time to make a decision based on the coming weather. Where we were anchored was protected from the sea swell to the North, but it wasn’t particularly protected from the wind due to the low-lying salt ponds immediately north of the beach. Since strong to gale force Northerlies were heading our way, we decided to take the safe choice and head towards Escondido to ride out what was being billed as a “honker”. 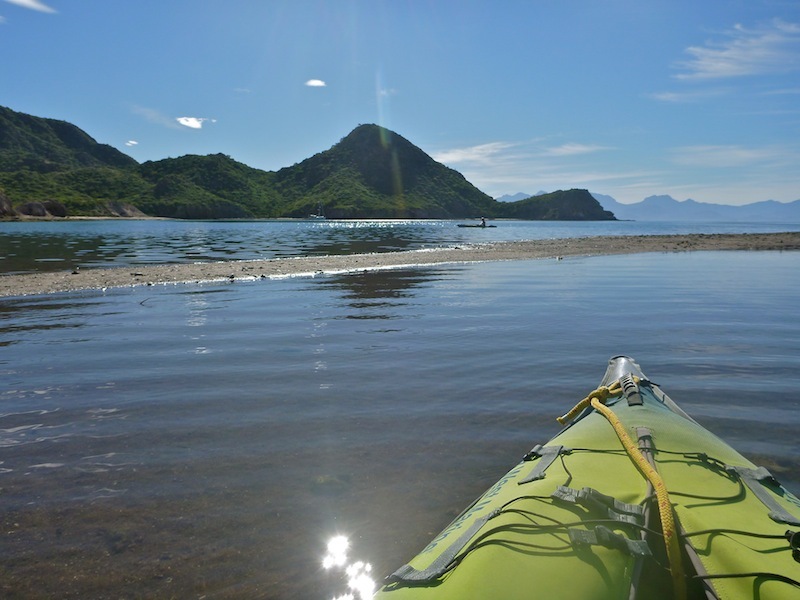 On a flat calm, glassy sea we headed south to complete our circumnavigation of Isla Carmen, and then decided to stop for one more night in Honeymoon Bay on Isla Danzante. It was a picture perfect afternoon and evening in the little bay, with a half moon and a calm sea. Then in the morning we awoke to the arrival of the Norther, and you already know the rest of that story! So there you have it…our week of peaceful paradise with intermittent bumpies! Stay tuned to this bat channel for further episodes of Permanent Picnickers in Paradise! ← It all becomes clear! Of course I meant Happy DANCE not Happy DANE. One Dane in the family is quite enough. Hola Martin Dane! Agree with Kacie – the photos really help enhance your enjoyable story. I’ve never seen so many shades of blue as I’ve seen in your water photos. The photo of the cathedral at Loreto is so interesting with that perfectly manicured arch of trees. Clearly there is a lot of pride there. What I like most about your journey is that you are able to leave Happy Dane and explore the sights. Getting into a city like Loreto must be a little bit of a shock after so much ‘quiet’ time on the seas. Another interesting and informing post. Always excited to anticipate the next one. Sail safe and have fun! of course I meant Happy DANCE not Happy DANE. One Dane in the family is quite enough! Hi Martin Dane! 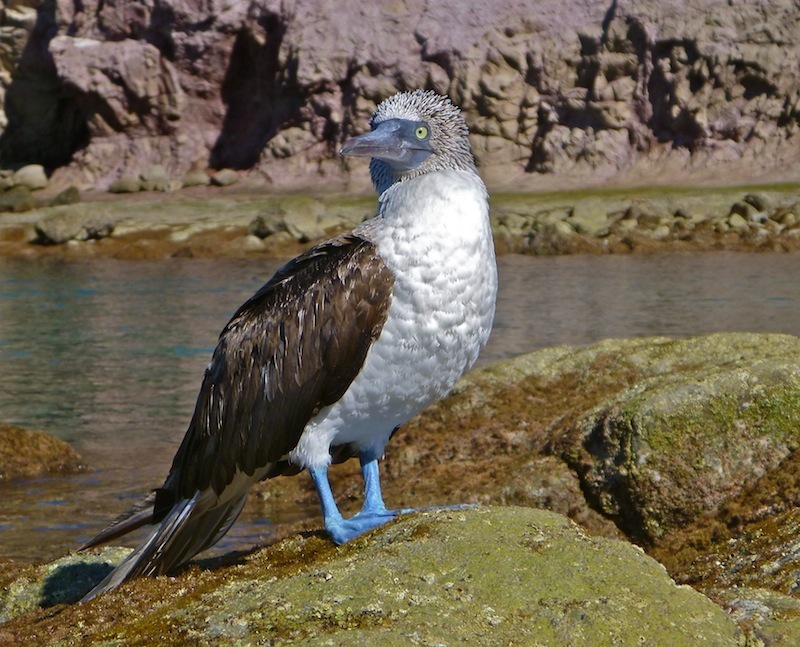 love all the photos – the blue footed booby is a hoot!